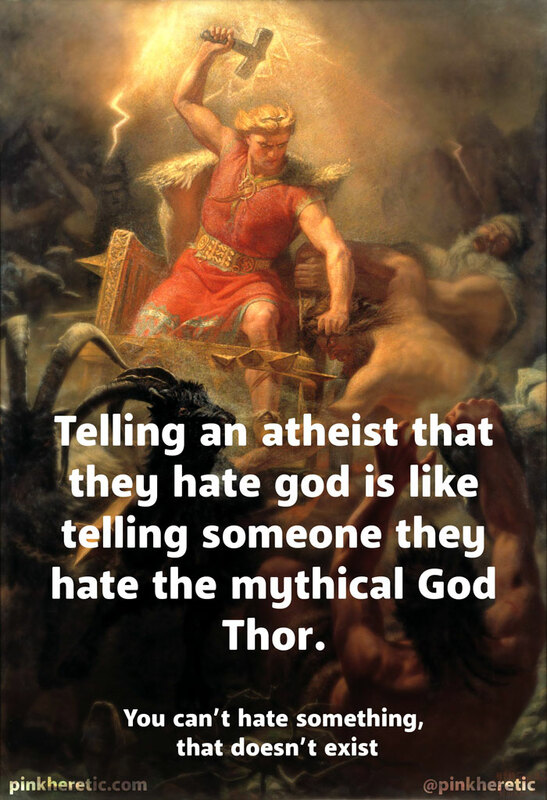 Let me say this so that it is very clear to all those who think Atheists hate God. We don’t. Why do I bring this up? Once again a creationist has stated this as if it were fact. I have seen creationists tell atheists this so many times as if they know us better than we know ourselves. This is one such comment. Let me clarify for you. I don’t hate God. Atheists don’t hate God. Hating something you don’t accept exists is lunacy. It would be like hating the tooth fairy, Santa or Thor. Can you imagine hating Superman? Could you hate The Joker or Penguin from Batman? No? I didn’t think so. Well that is how atheists feel about God. We don’t hate God because we don’t accept he exists. I have also had creationists say, “What was so terrible that happened in your life that made you hate God?”. Ah, nothing! I don’t blame God because he isn’t real. He is a myth, therefore blaming him would be rather stupid don’t you think? Life happens, bad things happen, people die. Guess what, that is just life. It is a part of life. It just is. There is no-one to blame and no-one to hate for it. It just…is. Another popular one is, just wait till something really bad happens to you, you will believe in God then. Um…nope. You don’t get to your forties and not have something bad happen to you. I have had several miscarriages, I have had a baby with a terminal neural tube defect. Like everyone, I have had grandparents die, family members die & I have had a good friend die. I have had a family member commit suicide. Why would you think that the reason I don’t believe in God is because nothing bad has ever happened to me? Why would I suddenly believe in God just because something bad did happen to me? Is it that I need someone to blame? Is it that I need to believe I will see my loved ones again when I die? No. I need none of those things. I accept that when we die, it is over. Many times creationists seem to think that they know Atheists better than they know themselves. They make the strangest claims about Atheists as if they have psychic powers that we don’t. They will claim atheists are evil, without bothering to find out whether we actually are. @sircraig01 The fact that God created means that evolution is the atheist's excuse to refuse to seek God and appease their evil conscience. I had one creationist tell me that he knew I had committed evil because I rejected God, which was an evil act. Really? Wanting evidence before believing in a God for which there is no evidence is an evil act? Here I thought it was just using my reasoning skills. This particular creationist seemed to believe all atheists are controlled by powerful demons. He refused to believe my reasoning that I couldn’t be possessed by a demon because I don’t commit deliberately evil acts. He was simply convinced I was a possessed by a demon and there was no convincing him otherwise. How are these sorts of claims reasonable? How can you call someone evil or possessed by a demon if you don’t even know them? Just the label Atheist means they are evil, terrible, bad? How do they know? They assume, because of their belief in God, but they don’t even take the time to find out if what they are saying is true. They just believe whatever evangelistic pastor tells them, without question, on pure faith. Having been raised an atheist I find the concept that ideas are more important than science or evidence is quite bizarre. Science adjusts it’s beliefs based on what’s observed. Faith is the denial of observation so that Belief can be preserved. What kind of world is this when in today’s day an age, when science and technology gives us so much, that we are too afraid to believe in what it shows us, for fear of it conflicting with our beliefs? Isn’t the truth more important than faith? Shouldn’t it be? Science is what gives us the truth. It requires rigorous testing, analysis, observation, and peer review before it is accepted. If anything is found to be wrong, its concepts are adjusted to reflect what the evidence shows. This is not the case for religion. There are many religious institutions such as AIG which set out to make ‘science’ fit their beliefs. They use confusing words and twist what we know to make it sound as if creation is true. They make strange claims that banana’s of all things were designed for us to eat. Do click on the link, it is pretty hilarious. I digress, but it would be nice if creationists sought to ask what we really think before assuming we hate god for whatever concocted reason. No we don’t hate God. We have no reason to. They just confirm their level of delusion when they use this ignorance in debate ?